Emphasizing on the power of the beard creates a strong bond of unity amongst your team members. Using the strength of your facial hair, beat down your sissy clean shaven opponents! 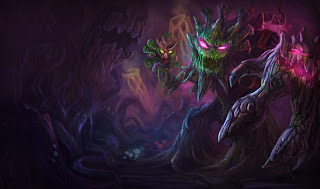 If Maokai's inhuman appearance bothers you, feel free to move GP to the jungle and add in Zilean! In order to execute this strategy properly you'll have to work together as a team from the very beginning. Since you have Gangplank, your level 1 will be stronger than most teams provided you're all organized, so feel free to invade (unless the enemy has tons of CC). For this post I'm going to focus more on bot lane since the rest of the lanes are generally going to be on a hero-by-hero basis for this team. If all your lanes lose there's no massive come-back in store for this team unlike some of the CC/poke comps. GP should start with your normal favorite support items, but also pick up an avarice blade as soon as possible to take advantage of parrrlay crits. Since GP's raise morale is an extremely powerful chasing mechanism, around level 6 let the lane push to your tower, which makes it super easy for Maokai to lane gank. Depending on how well this lane is doing, GP can swap between crit-plank for anti-carry power or a phage for extra peeling strength. 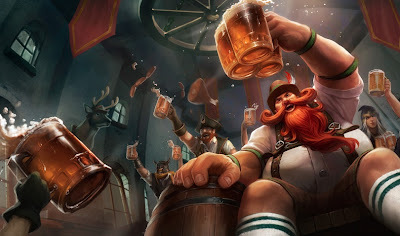 Besides some unusual bot lane mechanisms, the rest of the team should simply play as normally, with Gragas engagements combined with GP slows, followed up by some man-moding by Olaf. Maokai, (having the weakest beard of the group) may also engage if he wants attention. The normal strategies apply to this team composition as well. Maokai has a relatively weak start without blue, so try set up a successful invade against them. A sustainable bot lane will do well against GP/Graves, but it will be almost impossible to trade in an all-in with them simply because of the nature of GP. Once they hit 6, also be super careful of pushing up too far, since GP's ultimate + raise morale initiation is very easy to pull off, and effective as well. A good Janna will counter this lane. If you play this team composition and have some sick plays you get on recording, let me know and I'll post them up here! Got more ideas for team compositions? Ways to improve on this one? Post them below in the comment section! Swap Mao and GP in role and you may have a stronger team. Mao can bush pressure and snare for buckshot, GP can global harass and gank at the same time, just lower gank potential. That's a hard one, where can we find five female champions on the league???? riot, we need more girls!!! The rediculously overpowered late game team! Can also swap Sion and Nasus's positions, or include other champs that are powerful late game, like anivia, karthus or mundo. Haha, that's a team I wouldn't like to fight at 50 minutes for sure Meeaat! All 5 of these champions have an AOE knockback attack. The complete opposite to an AOE comp, they split up the enemy team and whittle them down one by one!